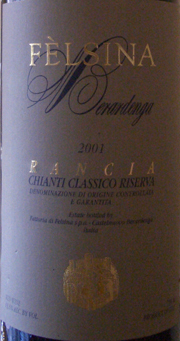 Chianti is made from the Sangiovese grape. The wines can vary from medium to full bodied, but are always fairly high in acid. Chianti typically has flavors of red cherry and often has a sweet rustic touch of leather or earth. Chianti and tomato sauce were simply made for each other. They both have great acidity and complement each other well. So any pasta that you'd put tomato sauce on is a pretty safe food to pair with Chianti. Don't limit yourself to pasta though; a good Chianti can really bump your dinner of frozen or delivered pizza up a notch or two. Roasted meats and stews also work fairly well with Chianti, particularly the Riserva (more carefully selected grapes and the wine is aged longer before release). Click here to see recipes that go really well with your bottle of Chianti.